This is part 1 of a 2-part article. Part 2 is now available to be read here. Small business owners have a lot to think and worry about. Usually, they need to fulfill many roles, chief salesperson, marketer, and manager amongst them. On top of that, they may have to keep an eye on industry trends, customer behavior, and numerous competitors – including other small businesses and national chains. However, running a small business doesn’t have to be overwhelming. In fact, if you take advantage of the latest technology trends you can find simple and cost-effective ways to run your company and stay ahead of the competition. We know this because we have been helping other business owners just like you to develop and implement custom apps and software for just over two decades. During that time the possibilities have only grown. We can help entrepreneurs do things that would have felt impossible just a decade ago. Even better, we can build custom solutions for much less than our clients tend to expect. Sometimes, business owners fret because the software they really need to solve a specific problem simply doesn’t exist. It might be that they have a desire for an unusual application, or that they need a plug-in to add extra features or functions to an existing product. In either case, custom development can be the perfect answer. A good programming team will help you add on to the apps you’re already using, or if that’s not possible, to design what you need from scratch. It’s no secret that better data reporting – a.k.a. business intelligence – can give you a real competitive edge. The more you know about customers, expenses, and market trends, the easier it is for you to make the right plans and investments. Unfortunately, while it’s easier than ever to gather data, aggregating it and deciphering thousands of points of information can be difficult. That’s where a custom app can make an enormous difference and lead to better decision-making at every level of your company. Any business owner will agree that keeping one eye on the bottom line is an important part of the job. But, how do you keep track of things like inventory, employee hours, and energy costs… not to mention hundreds or thousands of small customer transactions? The answer for many of our clients is to use specialized financial reporting apps that work as standalone solutions or extensions of existing software products. They let business owners get the detailed financial insights they need, updated continuously in real-time. In certain types of businesses and industries, document storage and retrieval can be an enormous challenge. For instance, some of the medical care providers we work with don’t just have to store charts, prescriptions, and insurance records, but also have to do so in a way that complies with HIPAA guidelines. Luckily, we can build custom software solutions that don’t just make it easy to save, store, and back up important documents, but also to retrieve them by searching criteria like dates and keywords. That can be a huge time-saver for a busy professional. Contact our team today to let us create custom solutions that are tailored to your small business. Eager to read more? WebRevelation will take a break from blogging on November 22nd as we celebrate Thanksgiving with family and friends, but the continuation of this article can be viewed on Thursday, November 29th. This is a continuation from the blog article posted on Thursday, November 1, which discussed the need for custom software development and programming to streamline the order and fulfillment process. You can read it here. With custom programming, you can more accurately forecast future sales and keep better track of what you have in your inventory. That means fewer lost items and orders, better order fulfillment (see above), and even fewer products lost to theft or breakage. Depending on what you sell, inventory control can be an enormously pressing challenge. Many of the business owners who initially come to us admit they don’t actually know exactly how much product they have on hand to sell or how quickly they could replenish their inventory if needed. In those situations, developing custom apps that yield the proper insights can become a huge priority. In today’s B2B e-commerce world it pays to automate inventory. You want figures adjusted automatically after purchases, returns, and deliveries. Most of all, you want to save money on orders for manufacturers by knowing what’s sitting in your warehouse at any given moment. Although we have focused on the technical and back-end aspects of custom app development so far, some of your biggest gains could be realized through more efficient marketing, increased repeat orders, and stronger customer service. That’s because you can use programming to improve or replace existing CRM solutions and build better buyer relationships in the process. Some businesses are really embracing the overlap between artificial intelligence and buyer engagement. It’s not hard to see how software that allows you to track customer interactions, tailor your marketing, or zero in on smarter pricing strategies could boost sales. And, when you’re able to automate things like regular purchases and returns you can entice customers to place bigger and more frequent orders. CRM apps can take many different shapes and forms and can be integrated with other pieces of software you already use. You can even use them in tandem with mobile devices to make purchasing your products convenient for your best customers. One side effect of getting the custom app you need to run your B2B e-commerce company is that you’ll get immediate access to more (and more accurate) information. You’ll have a better idea of where orders are coming in from, what you have in inventory, which buyers have the most valuable accounts, and how much time and money you're spending on fulfillment. Those are just obvious examples; you could get all kinds of insights in other areas of your business, too. With all of that data at your fingertips – presented in customizable, easy-to-use reports – you can start to make better and more informed decisions on where to spend your time and money. You can invest more heavily into campaigns that are showing a positive rate of return, offer bigger incentives to your best customers, and find ways to deliver orders faster while reducing costs. These are the nuts and bolts benefits that allow you to grow your bottom line for years to come. However, you can’t realize them until you stop relying on the generic software your competitors use and give custom programming a try. Ready to Put Custom Programming to Use in Your B2B E-commerce Business? 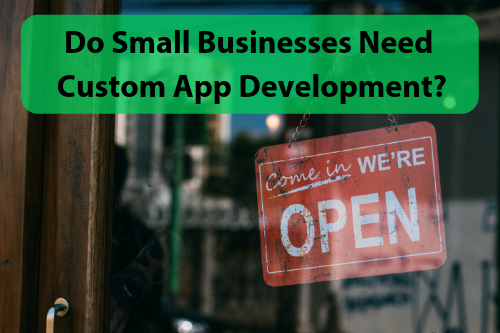 We have seen time and time again that the owners of B2B e-commerce businesses tend to get very excited when they understand the possibilities presented by custom app programming. However, we can’t give you personalized recommendations through an article. To see what kinds of benefits and possibilities are out there, you have to take the first step to learn more. Contact the WebRevelation team today so we can schedule a no-obligation consultation and talk about the goals you would like to meet. You might just come away from our meeting amazed at what we can do to help your company make the next leap forward. 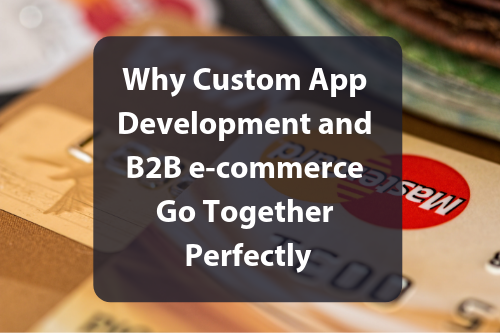 This is part 1 of a 2-part article highlighting the cohesiveness of custom app development and B2B e-commerce and the role they play in your business. Part 2 can be found here. It takes a lot to build a successful e-commerce business in any market or environment. However, B2B e-commerce offers a unique set of challenges and opportunities. On the one hand, the market for B2B e-commerce is enormous and growing. Virtually any kind of company is going to have to rely on other companies to provide important products and services. Like anything else, these can be sold more profitably and efficiently via the web. Additionally, having the ability to place orders online adds a layer of convenience for business owners that might be pressed for time. On the other hand, though, marketing and selling to businesses is a different proposition than providing products to consumers. People think differently when they are making purchases for a business. The sales tend to be more significant and complex, leading to more research and a higher number of interactions needed to close a deal. And, let’s not forget that virtually all B2B e-commerce markets are flooded with competitors. Smart business owners don’t worry about these challenges. Instead, they use innovative tools like custom app development to innovate and stay one step ahead of their colleagues. In today’s article, we want to look at some of the reasons you might work with a company like ours to develop specialized apps for your B2B e-commerce business. When you’re selling directly to consumers you only have to meet a demand or solve a problem with your products. In a B2B setting, though, there aren’t just buyer needs and budget factors to consider – there are also a number of logistical terms that have to be met. For example, what you sell might have a direct impact on your customer’s supply chain, their ability to operate effectively, or even whether they can deliver what’s needed to their customers. In that case, speed, efficiency, and cost controls might take on new importance. Or, there could be stringent industry and regulatory guidelines that have to be met for your products to work as intended. 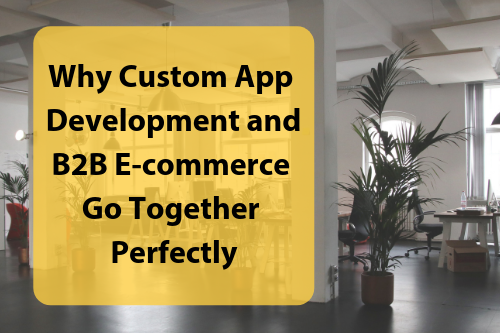 Because of the complexities involved, B2B e-commerce demands custom solutions. Why sell your products using off-the-shelf software when your buyers need something more specific? Fast fulfillment and delivery are crucial for the success of any online retailer, but it takes on a different level of importance when you’re dealing with B2B e-commerce. For all of the reasons we’ve already given, you simply can’t afford to lose track of shipments or have orders delayed. Custom app development can be used to streamline the fulfillment process, saving you time and money with every order that comes through the pipeline. Using automated tools, you can move every purchase from a warehouse or production facility to a wholesaler and buyer in less time than ever before. And, you can track that movement with live updates so the progress can be monitored by both you and your customers. Many B2B e-commerce companies suffer from fulfillment problems that cost them tens of thousands of dollars per year. That wouldn’t happen nearly as often if they were aware of how easy it is to get the smarter tools they need. The continuation of this article will be posted on Thursday, November 8th. Are you looking to streamline your E-commerce business? WebRevelation can help take your business to the next level. Contact us today so we can discuss your needs. Below is the continuation of last week's blog post, which can be read here. 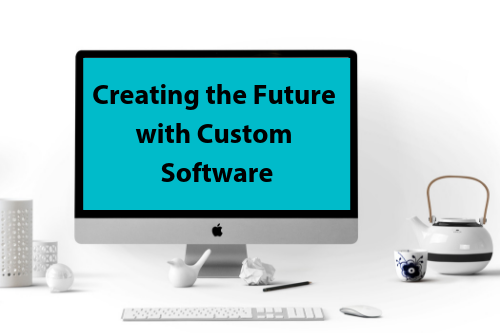 Read below as we lay out the final steps of Creating the Future with Custom Software. If you or one of your employees is in the habit of routinely entering large amounts of data into a spreadsheet or database then you have a striking need for software development whether you realize it or not. Custom apps can do many things, perhaps none so important as automating the task of data entry. Not only will using specialized software to collect data or integrate different tools together save you lots of time (or employee hours), but it can also greatly improve your accuracy. That’s because a stable app isn’t going to make mistakes, whereas a human would. Additionally, you can get access to more data than you had before if you’re collecting it in a way that doesn’t require your time. If you like the idea of having more data with custom software, then you’ll love the possibilities that present themselves when you can take advantage of advanced reporting in real-time. This is one of the areas where our clients typically find they can make huge bottom-line improvements. There are likely to be many different areas of your company where you could save a lot of money if you only had better information. Imagine what you could do with inventory, scheduling, pricing, and marketing if you always knew where your time and money was going, or which activities were generating the highest ROI. That’s an underrated component of having a software solution that’s designed specifically for your company. Good business owners and executives are always asking themselves “what if?” With custom software, they don’t have to guess at the answers. That’s because they can analyze current data, past trends, and information that has been mined or purchased to make smarter decisions. Planning ahead is all about envisioning certain outcomes and then making sure you can achieve them. However, things often seem “cloudy” when you’re dealing with an incomplete picture or several different unknowns. 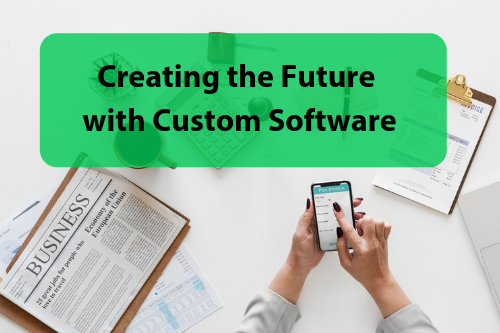 By using custom software you can help firm up plans and ideas even if you don’t know exactly what the future will hold. New technology is coming out all the time, but that doesn’t necessarily mean that your various apps and devices are going to play well together. Or, for that matter, that they are going to work with the hardware and software you have relied upon to run your business in the past. What’s the point of spending money on servers, mobile devices, or new apps if they are going to create more headaches than they take away? Custom programming can be an important bridge that brings together existing technology, new products you want to invest in, and your business goals. It can help you get more from every dollar you spend while improving productivity and can even make your data more secure. Want More Information Tailored to Your Situation? You don’t have to guess or wonder how custom software development could help you run a sharper business. At WebRevelation, we offer all new prospective clients a free consultation. That’s your chance to get expert advice on exactly how an experienced programming team can save you money, along with what it will take to bring your project to life. If you want real answers to the questions you have about making technology work for your company, contact us today! This is part 1 of a 2-part series. The first part of this article can now be viewed here. It has often been said that in the world of business, the best way to predict the future is to simply create it. In other words, if you set a tone and generate a solid plan, you are much more likely to get the outcomes you’re looking for, or at the very least, not be surprised by changes that are building on the horizon. We think this is a good philosophy and one that applies especially well to the world of custom software designed for businesses. That’s because our best clients look ahead and think about the kinds of situations they want to enjoy rather than simply reacting to what might be happening around them. Wondering how this works in the real world, or how it could benefit your business? Let’s look at a handful of common uses for software development. Will your business be growing in the future? If so, why not put together the framework for a bigger company now? By developing software that allows you to manage things like scheduling, inventory, or customer contacts, you can prepare for a day when you have a larger team, multiple locations, and bigger revenue goals. In the same way, smart business owners and executives can also use custom software to make their businesses more scalable on the other end of the spectrum. That is, they can maintain the same kinds of processes when things are booming and when they have the need to scale back. That’s a good way to control costs and ensure the business is always profitable. Often, we meet with business leaders who rely on generic software solutions – like CRM’s, accounting tools, and project management applications, for instance – simply because they don’t know they have other choices. However, your industry and business might not be like others, so why not use something that’s designed specifically for what you need? In the past, we have developed software for financial companies with intensive record-keeping responsibilities, healthcare providers who have to meet HIPAA guidelines, and even manufacturers who need special inventory and supply chain controls. We were able to save them tons of time and money by designing exactly what they needed instead of forcing them to work with “off-the-shelf” products. More and more, managing a smart marketing strategy means zeroing in on specific groups of buyers, controlling costs, and keeping close track of customer and prospect interactions. These are tasks that are best handled by custom software applications. As we’ve already mentioned, software works best when it has been tailored to a specific company, situation, and use. That’s especially true with regards to marketing, where every contact, expense, and campaign need to be watched closely. That makes custom software the perfect solution. The continuation of this article will be available on Thursday, October 25th. WebRevelation has over a decade of experience with building custom software to help business excel. Contact WebRevelation today for a free quote. 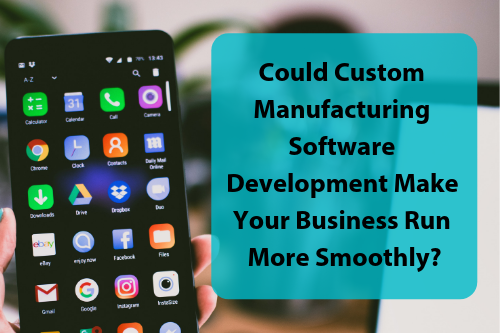 This is a continuation of last week's article, Could Custom Manufacturing Software Development Make Your Business Run More Smoothly?, which can be found here. Below we highlight a few of the ways you can use the power of programming to give your bottom line a push in the right direction. If there is one thing virtually every manufacturer on the planet has in common, it’s that they are all trying to identify and cut out unnecessary costs. Once the most obvious expenses have been eliminated, though, you need the kind of insights you can’t get from simply taking a walk across a factory floor. This is another area, of course, where custom manufacturing software development comes into play. By giving you the ability to collect thousands of data points at once and analyze trends, inputs, and expenses, the right app can help you spot any sign of waste or inefficiency. In the past, our clients have used specialized software to optimize employee schedules, save money on shipments, reduce fuel and energy costs, identify cost savings with raw materials, and even find better pricing margins when dealing with retailers. Are there parts of your manufacturing business that are costing you more money than they should? No matter how much you automate your manufacturing business you’ll still have to stay in constant contact with employees, vendors, and even customers. With the right custom software solution, you can integrate numerous different apps and devices together into a seamless network that takes many of your most pressing headaches away. Imagine being able to reach out to a company that provides key inputs and tracking of incoming shipments. Or, think about what it would be like to be able to communicate directly with a driver or warehouse manager. Imagine being able to send a signal down to the factory floor at a moment's notice, or to reach out to an employee to let them know about an impending schedule shift. Now imagine being able to do all of these things from one single platform and interface. Communications tools are everywhere, but manufacturers need solutions that work inside the framework of proprietary applications. With custom software you can watch inventory, finances, and a lot more, all while having the option of managing communications from one hub. It’s easy to forget that communication is a two-way street. Just as you need to be able to reach everyone involved in your supply chain, it’s just as crucial that certain people – like supervisors, sales reps, and wholesalers – have the ability to stay in touch with you, as well. By developing custom apps that tie into mobile devices and workstations, you can make it more convenient for others to keep you in the loop. That can translate directly into more sales, fewer returns, and better service. It also helps you to develop and maintain strong relationships with the people you depend on. Manufacturers can use mobile apps for inventory, reporting, CRM's and marketing, or even pricing and presentations. Doesn’t it make sense to give your employees, vendors, and customers the tools and data they need to work with you right at their fingertips? Want to Learn More About Custom Manufacturing Software? At WebRevelation, we combine decades of programming experience and business know-how to help our clients achieve the extraordinary. If your manufacturing business could be using technology to get ahead, rather than just keeping up, you should schedule a free consultation with our team today. Why not reach out so we can show you how custom software development can make an immediate and measurable difference in your manufacturing business? It only takes a moment to contact us, and it could turn out to be the best decision you ever make for your company.